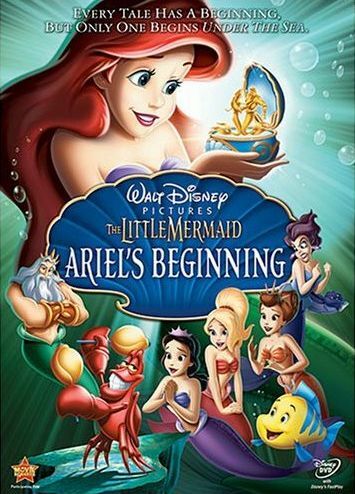 Recently my wife and I watched Disney's The Little Mermaid - Ariel's Beginning , which is one of those straight-to-DVD releases that seems to have become quite popular with Disney. Unfortunately, they never seem to be all that great, and this one is no exception. The story is rather simple, and takes place before the events of the original film. It starts off with Ariel and her sisters as little kids. Their father, King Triton, was happily married to their mom, Queen Athena, and everything was great and wonderful... and dull. Everyone is singing (a very forgettable song, I might add) and swimming and having a good time near and above the surface of the water. This opening seemed to drag on with the kids and other creatures of the kingdom, and King Triton gave to his wife a gift that he had made, which was a beautiful music box that played a nice melody. Eventually, the plot is moved forward when two things happen and exactly the same time... a storm instantly forms and a pirate ship dramatically disrupts the party, I guess doing some fishing or something. I'm not exactly sure, as this whole scene just felt awkward. I'm guessing they just didn't see the merpeople as they shot their harpoons out into the sea, except some of them hit on the rocks so... they were aiming for the merfolk? Or they were just randomly shooting into the sea? Anyway, everyone scatters, but Triton's wife goes back to grab her music box, and is crushed by the ship... because the ship was trying to slam into the rocks? Like I said, awkward scene. So a period of mourning follows, in which King Triton bans all music from his kingdom, since the song from the music box hurts his soul too much. Fast forward several years where Ariel and her sisters and now teenagers. The kingdom has become a dreary place, and the girls have an equally dreary governess named Marina Del Rey. Everyone seems to accept how things are... everyone except Ariel, of course. So she gets in trouble for playing with her sisters, and for punishment is sent to scrape barnacles off a reef or something. And this is where she meets her new best friend, Flounder. Flounder used some nearby rock tubes of some sort to create music, and when guards hear this they chase Flounder and Ariel all through the kingdom and eventually wind up standing directly in front of Sebastian as the guards catch up (and when I say "standing", I don't mean literally, as neither of the two have legs). Ariel is sent to her room and Sebastian reluctantly sets Flounder free. That night, Ariel somehow catches a glimpse of this bright yellow fish from her window, and decides to follow him. Eventually she winds up at his final destination, a secret club where they play music! Oddly enough, the song they are playing is Jump in the Line ... and this song is used again several times throughout the show. There were only a few original songs in this film, and using this one multiple times made it feel like they cheaped out on the production. At any rate, moving on, Ariel discovers Sebastian is at the head of the party, which shocks the little crab, but she of course agrees to keep it secret... which, of course, doesn't happen. So the next night her and her sisters head to the club, and thanks to Marina Del Rey, King Triton catches everyone, shuts it down, locks up Sebastian and the band, and sends Ariel to her room... because that worked so well before and all. Well, I don't want to give the whole thing away, but suffice to say Ariel is determined to continue singing and listening to music, and of course there will be a happy ending. So lets move on and talk about the new characters. Marina Del Rey is the new villain, though she's not so much evil as just sick and tired of dealing with all of Titan's daughters... and who could blame her? Plus, Sebastian's attitude toward her doesn't help things. Then there's the club band, of which we really don't delve into their characters too deeply. Actually, we don't delve into any of the characters too deeply here. My favorite of the new characters were Ariel' sisters, who would constantly bicker as sisters do, but found that part to be the most enjoyable of the film. And finally, there's Marina Del Rey's assistant, who looks totally out of place here. I guess he's supposed to be a manatee, but he really looks like he belongs in a different cartoon completely. I liked him, and his subtle comments, but every time he came on screen it just yanked me out of the movie. I should also note that this film is quite short, coming in at around an hour and ten minutes, not including the end credits. This does not help it feel like a feature Disney film, not in the least. But I can understand why, as there is really very little story here. I actually believe it could have been done as a half-hour show. There are a few extra features here, included a couple deleted scenes (which aren't fully animated), a behind-the-scenes look at the making of the film, and a backstage look at the live action musical. Then there's the standard games and activities that I never bother with but I guess kids would enjoy. Oh, and the song selections, which I'm sure is also for kids, at least for this film. So if you have kids, I'd say it'd be fine to rent, but I doubt any adult would want to own this as part of their collection.